PETER GOLEMME is a graduate of the University of Chicago Law School (JD 1981), where he was a member of its Law Review, and of Boston University School of Law (LLM in Taxation, 1987). He also has degrees in English literature from UCLA (MA, 1978) and Northeastern (BA, 1975). Upon graduating from law school he served as law clerk to Judge Harry Phillips of the U.S. Court of Appeals for the Sixth Circuit, and began private practice in 1982 as an associate in the tax department of Hale and Dorr in Boston. In January 2007, he became Of Counsel to the firm of Taylor, Ganson and Perrin, LLP. For the previous fifteen he had maintained his own practice in downtown Boston, representing individual, corporate and nonprofit clients. His practice includes domestic and international tax planning for individuals and business entities, estate planning and probate court representation for domestic and international clients, representation of a wide variety of exempt organizations, and general tax and corporate work for start-ups and small business entities. He presently serves as a consultant/advisor to the IRS-funded Low Income Taxpayers' Clinic at Greater Boston Legal Services, Inc. and is actively involved in community work, serving on a number of Boards of community organizations in South Boston, Massachusetts. 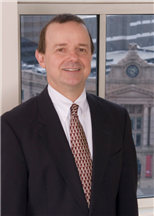 He is a former Co-chair of the Boston Bar Association Estate Planning Committee, and has taught taxation in the Boston University and Northeastern University programs for financial planners.